GIOVANNINO Yacht Charter - Toy Time! Doug grew up in NJ and moved to Jackson, WY after school. He worked for the Jackson Hole Mountain Resort as an assistant mountaineering supervisor for the Ski Patrol. In the summer he ran his own business, guiding fly fishing trips throughout rivers in the west as well as Russia. After living in Jackson for a while, Doug became passionate towards the need for Search and Rescue in the community and became the Teton County Search and Rescue Coordinator. He has extensive medical training and experience and put his heart and soul into helping the community. During his time off he would go sailing and fishing in the Bahamas. He was part owner of several sailboats that he used to cross the Gulf Stream for his excursions. Doug met Sue in Jackson through their mutual interest in sailing. Together they dreamed of ocean breezes and soon decided to leave the frost behind. They managed a fly fishing lodge in S. Andros, Bahamas for a couple years, commuting back and forth from the States on their trimaran. Seeking to explore more of the Caribbean they started chartering sailboats. They chartered in St. Martin, St Barts and Anguilla and also in the Grenadines. 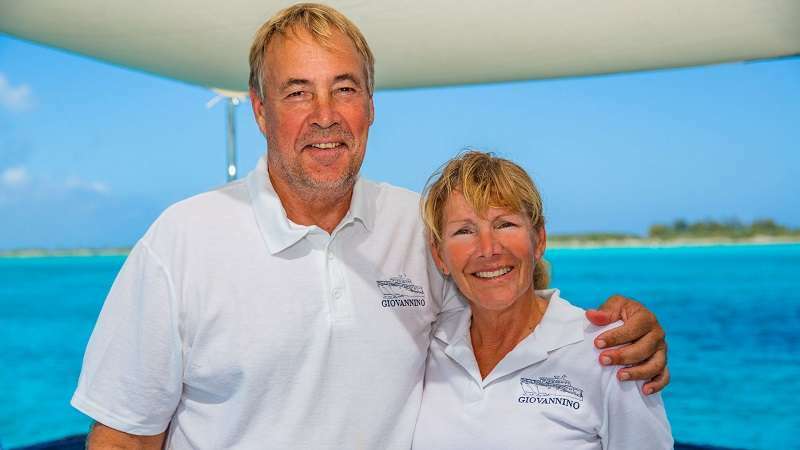 But the Bahamas is their passion, so they found the beautiful classic yacht Giovannino and brought her to the Bahamas to share their passion of beautiful beaches, pristine diving, snorkeling, fishing and the sparkling turquoise waters. Sue also grew up in NJ and had a career in the IT industry. She was working in New York when 9/11 happened. Soon after that she sold her house, packed up her car with a tent, sleeping bag and a mountain bike and took some time off of work to experience life driving across the country. She spent some time in Jackson Hole and knew one day she would return, buying a cowboy hat as evidence of her desire. Eighteen months later she moved to Jackson. She worked as the IT Specialist for a travel agency that arranged travel for rock bands and film production companies. One of her coolest experiences was ‘bumping into’ one of their clients, Steven Tyler of Aerosmith in Bangkok, Thailand while vacationing with Doug. Sue always dabbled with sailing early on having friends in Cape Cod, MA and Newport, RI. She also went on several sailing trips in the British Virgin Islands and St. Martin. After she met Doug they bought a sailboat to commute to their job managing a fly fishing lodge in S. Andros, Bahamas from the States spending a month or so at a time cruising in the Bahamas, especially the Exumas. Besides cruising in the Bahamas Sue’s passion is cooking, especially entertaining. She loves preparing gastronomic creations for her guests as well as tending to their every need. 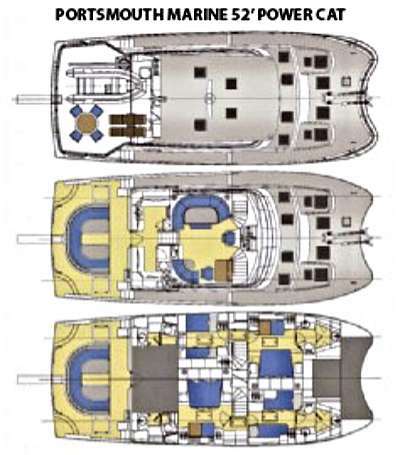 Other Entertain: Open top deck for sunning -- no bimini, main deck deck has covered outdoor space for shade.